Formulation: Liquid. In 30mM TRIS, pH 8.0, containing 100mM sodium chloride, 1mM DTT, and 0.4M arginine. 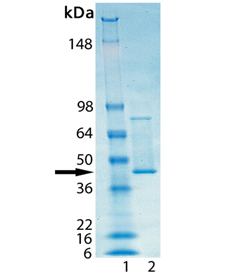 Endotoxin Content: < 50 EU/mg determined by Limulus Amebocyte Lysate (LAL) gel clot assay.